Aside from the Philippine Blog Awards’ Visayas Leg, we had another mission in Cebu: to eat, and to eat well. Lucky for us Cebu has a lot of great homegrown restaurants that not only serve good food, but are also quite affordable. Abuhan’s beef pochero. Photo from file because I couldn’t be arsed to take any photos that evening. Our first meal in Cebu was at Abuhan Dos, a favorite of mine since my first trip to the island back in 2006. I always make it a point to eat here when I’m visiting, and I convinced Gail, Marc and Juned to try it out last Friday night. 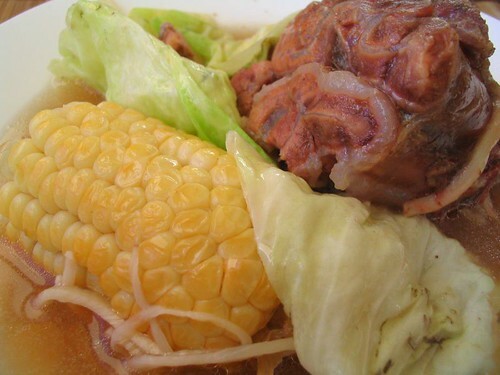 Pochero in Cebu is what we in Manila would call bulalo (beef bone marrow soup). A huge beef shank was served in an equally huge bowl, surrounded by meat, veggies, corn and the best full-flavored beef broth. As if this wasn’t sinful enough, we paired it off with an order of Sizzling Pochero: the same tender beef shank slathered in creamy, buttery gravy served in a sizzling plate. YUM. I was so happy that the first timers in Abuhan loved it, including Sha and Karla who arrived later that night. Lunch the following day was at a beach in Talisay. Markku took us to his hometown, and we were treated to a taste of Talisay lechon, as well as a number of fresh seafood. Apart from the usual grilled and fried fish, we were also able to some exotic seafood: sea urchin, sea cucumber, and this one thing that looked like some sort of shell. We were all wary of it, but when someone was brave enough to try it and pronounced it good, we followed suit. It was pretty good. Tasted like squid. Can anyone tell me what this is? It tastes like squid, and everything is edible, except for the tip. Before we parted ways that afternoon, Winston suggested that we try Moon Cafe at the Ayala Terraces. The place had a Mexican theme going on, and serve a number of Mexican specialties. However, most of the items in the menu are Western and Filipino fares. But ah, the food was good! We ordered food like there’s no tomorrow: nachos, pizza, flautas, sisig and several plates of baby back ribs. Most of what we ordered were a big hit, specially the sisig and the baby back ribs. When the bill arrived, we were all surprised: the total cost was just a little over Php 3,000. Considering that we were a table of 10 and we ordered a shitload of food, we expected a much higher amount. RELATED: The Aliwan Fiesta is here again! 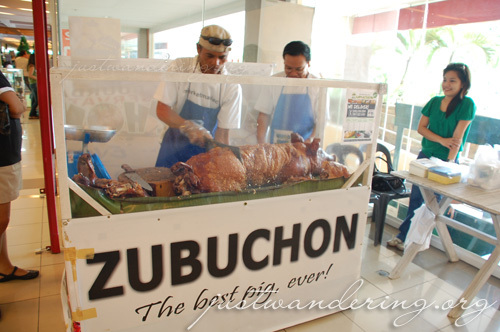 best pig ever.” Zubuchon is available for whole lechon orders any day of the week, but on Sundays, you can troop over to the Banilad Town Center to buy per kilo. The lechon has been generating a lot of buzz in the local Cebuano media, so we thought it’d be best to go there early to ensure that we don’t ruin out of lechon. True enough, we arrive at 10:05 (the Sunday market opens at 10am), and they were already hacking away on their second lechon. There were two customers ahead of us, and right before we left, there was already a small line forming. As Marketman mentioned, Zubuchon is not your typical lechon. It does not have the smooth skin lechon usually have, instead it has a texture much like chicharon. Actually, the skin tasted like chicharon, only a tad sweeter. Ahh, how my mouth water just thinking of this lechon. 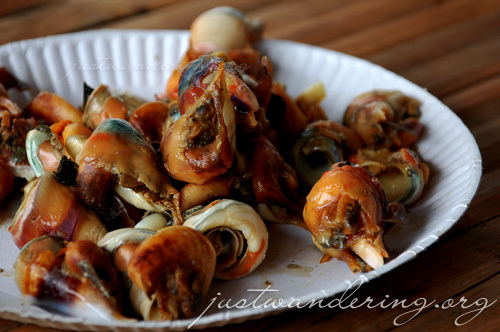 Our last meal in Cebu was at the Golden Cowrie restaurant in Lahug. This came highly recommended, and we were all looking forward to trying out their much talked about Baked Scallops. The scallops exceeded our expectations, and we ended up ordering two more in the course of the meal. Aside from the scallops, we also had the equally exceptional gambas, as well as the cripy pata, native chicken tinola, escabeche, tuna fingers and sweet chili chicken. The eating doesn’t end in Cebu. Just before we headed to the Mactan airport, we made a last stop at Tabo-an market to buy souvenirs to take home. Tabo-an is your one-stop shop for pasalubong shopping in Cebu. Just as long as the only souvenir you’re planning to take home is food, that is. Different variations of danggit by the bushels line all storefront, along with other kinds of dried seafood. Inside the stores are other Cebuano delicacies like the Cebu longganisa, otap, rosquillos, dried mangoes and chicharon. Each of us took home several kilos of dried fish and other snacks, enough to last us until that next trip to Cebu. Woot, sarap talaga ng food sa Cebu! Hehe, haven’t tried the shellfish though. Oh…WOW. Talk about LECHON! I haven’t seen the No Reservations episode where Bourdain visits the Philippines. Must. Get. It. Thanks for reminding me. Oh, and I must have some of that…erm…squid-thingee. Why can’t you eat the tip? I tried the baked scallops, too and THEY are HEAVEN! Estan: the one we had can be eaten as is. Or maybe it was removed from the shell already? bchai: The tip is like the tip of a crab claw. It’s pretty hard. teeyah: I was looking through my photos this evening and my mouth waters whenever I see the photo of the scallops! I want to try this baked scallops and it is for sure on my list to do. Im glad you guys loved our city! grabe talaga pagkain sa cebu lalo na yung lechon. kahit walang sarsa ay masarap pa rin. Kristine: There’s a lot to love about Cebu! Lawstude: Sobra! Kahit di kami masyado naka-explore, okay na dahil sa food. Very nice images. I like this type of food and is working great with white wine. I love Mooon. I didn’t know you went to Banilad. tsk tsk tsk. nina, bchai, the tip is called the operculum of univalve shells. this is hard and inedible and in the case of this kind of shellfish, serrated and sharp. lawstude, di uso ang sarsa sa lechon cebu. eat it as it is. I love food trips in Cebu! I am in Cebu right now for a vacay and I’m telling you, I’ve been eating almost non-stop. LOL. I love Abuhan, be it Uno, Dos or Tres. I always go there with friends after an all-nighter. Their Pochero and Sizzling Pochero were superb. Golden Cowrie’s Crispy pata and scallops are one of the best. The prices are also very affordable. I haven’t tried Mooon Cafe though. Maybe when I get back to Cebu for the Nth time. I’m going to visit BTC this sunday to try MarketMan’s Zubuchon. So excited! Thanks for sharing your Cebu experiences. More happy travels to you and take care!